Jan. 27 will forever be a day of mourning for the Concordia Stinger family. It was this day, in 2006, that former women’s soccer player Erica Cadieux was killed after a driver, who fell asleep at the wheel of her SUV, hit her. Cadieux was pushing her 18-month-old baby in a stroller before being fatally struck down by the vehicle. “[It was] very disheartening, very heavy,” said Carlo Spadafora, Cadieux’s widowed husband. 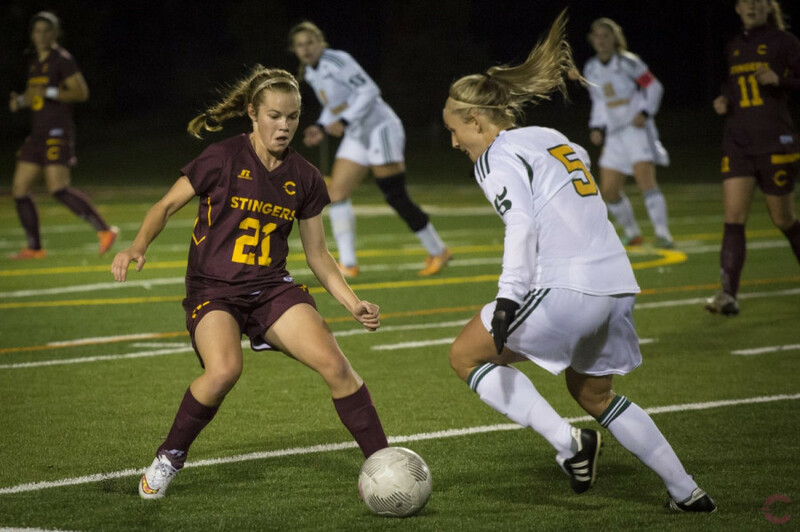 In remembrance of Cadieux, the Concordia Stingers held their 10th annual Erica Cadieux Memorial game at Concordia Stadium this past Friday night. Spadafora and his daughters, Bianca—who was in the stroller as her mother was hit—and Olivia, greeted both the Stingers and their opponents, the Sherbrooke Vert et Or, at midfield. Despite the Stingers 2-1 loss to the Vert et Or, it was still a successful night for the team as they raised donations and collected gifts for the Montreal Children’s Hospital. Current Concordia Stingers women’s soccer coach Jorge Sanchez never coached Cadieux, but says that he’s spoken former teammates about her. “She represents what it is to be a student athlete,” he said. Ten years on, the Erica Cadieux Memorial game still remains a tradition at Concordia and serves as a meaningful event for the school. “It’s all about creating a tradition that someone can hold onto,” said Sanchez. The annual game remains close to Spadafora’s heart and has sentimental value for him and his daughters.